Register early to ensure a spot. Hastings Family Fare Supermarket is generously providing all racers with a free lunch. Hot dogs (meat & veggie), brats, sides and beverages will be served. A small donation is requested from non-racers. The professional staff of Velo City Cycles will be onsite to provide assistance with any last minute mechanical issues you encounter. Newton Timing and Race Services knows that running a time trial requires accurate and reliable timing. Look for them and their state-of-the-art timing at the start and finish. Our title sponsor Spectrum Health Pennock will be onsite to provide medical assistance. Look for the medical tent along Team Row for any race related medical needs. T-shirts commemorating the 30th year of the race will be available for purchase for $15. Make sure to add this to your cart when registering. Jenny Acker has once again come up with a great design. Fee's are age based and apply to all categories. * Start times are based on the date and time you register, so register early for the best starting position. * Only available if the race does not sell out. * Sorry, but no credit cards accepted for day of registration. Cash and check only. Sorry, but we do not handle transfers. This race is an all volunteer effort and we do not have the resources to handle this. 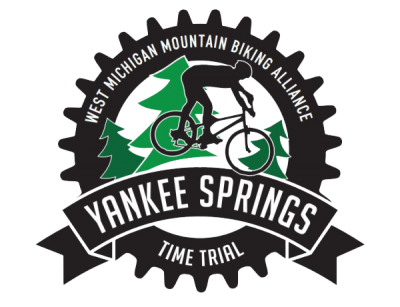 Rest assured that your registration fee goes to support trail building and maintenance for trails here in West Michigan. BikeReg now supports self managed category changes for participants. A small fee of $5.00 will be charged for this service. For more information, visit the BikeReg web-site. Sorry, but there are no refunds. This race is an all volunteer effort and we do not have the resources to handle this. Rest assured that your registration fee goes to support trail building and maintenance for trails here in West Michigan. 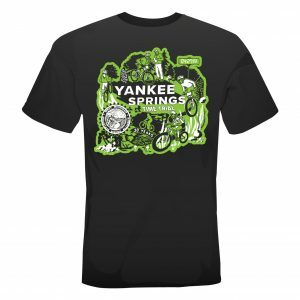 The Yankee Springs Recreation Area is conveniently located halfway between Grand Rapids and Kalamazoo. Both cities have great lodging and entertainment options available. 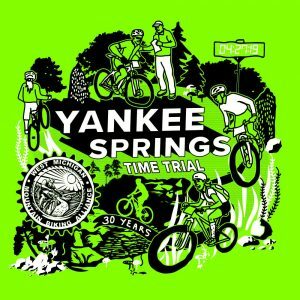 Racers who prefer to be closer to the race or who prefer to enjoy Michigan's small town appeal can look for lodging in the Hastings, Wayland or Gun Lake area's.